Carpobrotus edulis growing succulent creeping subshrub of the genus Carpobrotus also known as Ice plant, Carpobrotus edulis perennial evergreen plant, used for edible the fruits and edible leaves but mostly used as ornamental drought tolerant plant and ground cover plant, can grow in subtropical, mediterranean, tropic, desert or temperate climate and growing in hardiness zone 8+. Leaves edible color green or red in linear, the leaf is fleshy. Flower color yellow or pink-purple with multi petals. Fruit edible the color is green in a fig shape. 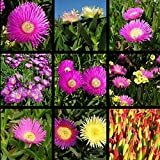 What can be done with big quantities of Carpobrotus edulis fruits?